The finished chair with Cath Kidston Tapestry seat. 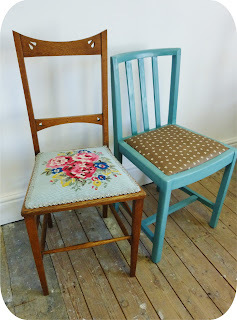 Last week I finished this really lovely little tapestry covered chair, and forgot to blog about it! I just wanted to show you how a little chair can have a big personality. I cleaned and treated the wood, mended the wobbly joints, and gave it new webbing and stuffing. The tapestry had been done by the customer, and was a pattern from one of the Cath Kidston stitch books. The trim was from John Lewis and matched the wool colour perfectly. Tapestry can be a lot more fun than pictures of kittens in baskets (although if kittens in baskets is your thing - go for it!) I wanted to see if I could find a tapestry I would like to do and came across the amazing work of Charley Harper Have a look at more of his beautiful illustrations turned into tapestries on the Purl Bee craft blog. Imagine those beauties on a chair!